Far West Texas (Texas Land Market Region 2) encompasses approximately 22 million acres, three quarters of which are categorized as rural. Its entire population is slightly less than that of Austin. Leisurely drives require packing supplies and planning fuel destinations since drivers can go miles without seeing a gas station or structure of any kind. The alluringly desolate scenery has been the catalyst for business ventures and has even enticed visitors to relocate there. However, the rugged region has proven too harsh for many of them. Resorts, tourist attractions, and even homes or entire towns lie abandoned along highways throughout the region. Lack of access to water and electricity—let alone the area’s general remoteness—means living there requires more money and energy than most would-be residents are willing to spend or can afford. The region’s land prices have grown substantially because of oil and natural gas drilling and, more recently, sand mining. Even so, these economic drivers have not translated into demand for ancillary support from local communities in terms of residential housing and other amenities. As a result, land appreciation is isolated specifically to tracts where production is taking place. 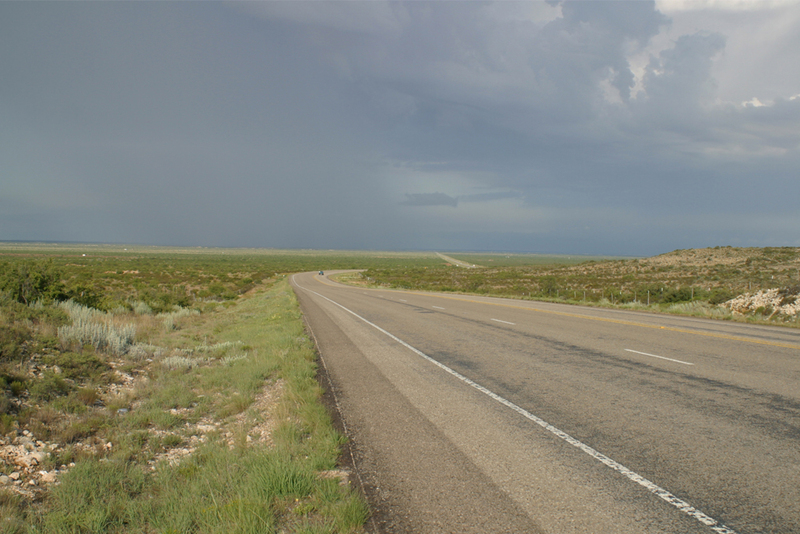 Given the remote nature of Far West Texas and its unique land and climate, the characteristics of its land sales differ from those in the state’s other land market regions. On average, the size of a Region 2 land sale greatly surpasses the average acreage sold in any other region. In second quarter 2018 (2Q2018), Region 2’s median acreage sold per transaction was 7,732 acres. The next largest was Region 3 (West Texas) at 418 acres, 5 percent of Region 2’s median acreage. Region 2’s sales volume is also substantially lower than those in other regions. Eight sales occurred in Region 2 in 2Q2018. Region 6 (South Texas) had the next lowest number at 129. Another major difference is the median price paid for Region 2 land. Ninety-six percent of the land is used for native pasture, a less productive land-use type than crop production. Combined with the area’s general remoteness, this causes the median price for Region 2 land to be the lowest in Texas. In 2Q2018, the median price per acre was $983. Region 1 (Panhandle and South Plains) had the next lowest median price at $1,022. For historical data on all Texas’ land market regions, go to www.recenter.tamu.edu/data/rural-land/. Many Far West Texas towns were developed to support railroad or mining operations. Mining and mineral extraction still prove dominant economic drivers in the region, but less likely drivers have also emerged—resorts and tourism, for example. Both have developed either from a desire to capitalize on the remoteness and “Old West” nostalgia or as a matter of necessity for local communities. Whether because of a change in industry or unrecoverable costs, the residents of Far West Texas are all too familiar with the pattern of development, decline, and abandonment of projects and entire towns. Standing as monuments to this pattern are the remains of buildings where thriving towns once existed. Towns such as Sanderson and Marathon were founded during the expansion of the Galveston, Harrisburg, and San Antonio Railway in the 1880s. The towns supported the operation of the railroad line and its workers. Surveyors reached Sanderson in 1881 and Marathon in 1882. By 1883, a depot and post office were built in both towns. Sanderson’s population peaked at 3,000 but dwindled to 800 over time. Rail operations eventually moved to Alpine, taking rail line workers with it. Despite the loss of the railroad, the town benefited from US 90 running directly through town and serving as the primary east-to-west route. The completion of I-10 rerouted travelers 60 miles north, further diminishing the town’s potential customers. Rail made Marathon the principal shipping point for Brewster County and served as a hub for local ranchers and the mining operations in southern Brewster County. Livestock, wool, and large game animals were shipped out of the depot, and supplies were shipped in and distributed. In 1884, the town had a modest population of 50. By 1896, it had doubled in size. The population peaked at 1,000 in the late 1920s and fluctuated between 500 and 1,000 residents into the early 1970s. Many factories operated in town throughout that period, including two rubber companies, three wax factories, and a soil conditioner and fertilizer factory. By 1990, the town remained a center for ranching, but the only other remaining industry was a fluorspar mining company. Today, the town boasts a population of about 470, and its primary industry is tourism, serving as “the entrance to Big Bend National Park.” The town’s main attraction is the historic Gage Hotel, but there are other hotels, shops, and restaurants for park visitors. Shafter is one of the best examples of a Far West Texas boom-to-ghost-town story. Shafter was known as a “company town,” meaning its survival was completely dependent on a local company. In 1881, John Spencer and William R. Shafter discovered silver deposits in the area and established Cibolo Creek Mill and Mining Company and the Presidio Mining Company, later merging to become the Presidio Mining Company. By the early 1900s, the town had six silver mines and a population of 110. By 1926, the mining property was acquired by The American Metal Company of Texas and mine production had increased over 300 percent to an annual production of 84,000 tons. By 1934, a decline in silver prices halted mine operations. The onset of World War II and the town’s proximity to Fort D.A. Russell and the Marfa Army Air Field boosted the town’s economy. The town’s population reached 1,500 residents. After the war ended, the bases closed, and the population dwindled to 20 people. Since that time, little industry has returned to the area, and Shafter boasts a total population of 11. Most buildings are uninhabitable, with the roofs and walls falling apart. The town may once again have an economic revival; Aurcana Corporation acquired the mining site in 2008, building a mill, refinery, warehouse, and an administrative building. Operations ceased in 2013, again due to a decline in silver prices, but the company has released statements about continuing exploration of the site and surrounding sites. Aurcana anticipates production levels of 11 million ounces of silver over a six-year period and plans to invest $120 million in the project. Stories like these are common in Far West Texas, although the railroad is no longer the economic driver. The industries driving the booms have changed and so have the sentiments of the residents. There is no longer a push for permanent development or expansion of local businesses to support the population increases from a new industry. Residents don’t believe an economic boom will last long enough to warrant the cost of expansion. 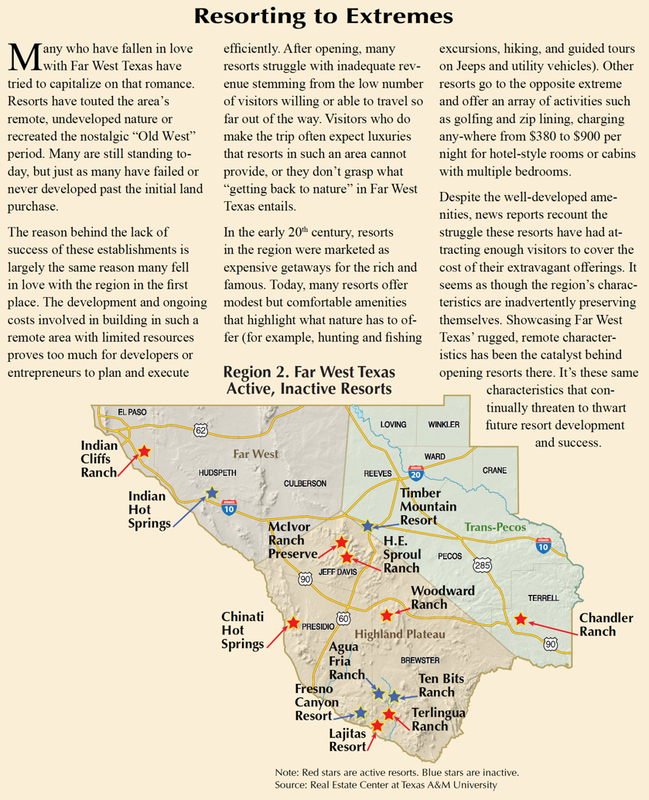 The present economic driver in Far West Texas, while not a recent development, is the oil and gas boom. Oil production began there in 1926 with Yates Oilfield in Pecos County. Texas’ oil industry developed rapidly, becoming a dominant player in U.S. oil production by the 1940s. Today, the Permian Basin is the nation’s largest inland petrochemical complex, a result of the introduction of hydraulic fracturing or fracking, technology. The technology allows for horizontal drilling, which makes drilling through the formations economically feasible. The large number of trucks and oil rigs that drivers pass while traveling through Region 2 are evidence of the area’s continued boom. As a result, oil and gas is a major driver of the region’s land prices. The median price per acre has increased nearly 200 percent over the last decade. The recent upward movement in land prices stems from land purchases for sand in the northeastern portion of the region, previously regarded as the region’s least productive land. Sand dunes sales reached nearly $10,000 an acre. Demand for sand rose from oil price declines and from oil companies needing to reduce costs. Fracking uses sand as an input. The use of Region 2’s near-perfect substitute for sand reduced the substantial transportation costs incurred when importing sand from northern states, such as Wisconsin, and made the land with sand-mining capabilities extremely valuable. Several companies have bought land and begun sand-mining operations. Some have noted there is enough sand in the region for thousands of years of production. The swift production of these initial sand mines and the substantial supply of sand will likely result in future transactions reverting to price levels consistent with historical averages. Monahans, known as “The Center of the Permian Basin,” began as a ranching and farming town until the 1920s when oil production arrived. The town’s population at that time was around 89. It grew substantially into the 1970s. The town witnessed nearly a 400 percent growth rate from 1930 to 1940 and averaged about 50 percent growth over the next two decades. The town reached its largest population in the 1960s at about 8,570 residents. From 1970 to 2000, oil and gas activity declined; the population of Monahans fell about 20 percent. Today, oil and gas production continues to grow and be a major part of the local economy, but the town population has not recovered or grown at rates witnessed during previous booms. Mentone was also established as a result of oil exploration. The town reached its height in the 1930s with 600 residents and businesses that included hotels, drugstores, barbershops, a dance hall, and a machine shop. The town even had a newspaper that published for three years. Today, the population has dwindled to 19. There is a courthouse, gas station, and post office. Only a food truck and one ready-made restaurant serve oil field workers. The restaurant is in a storage building, and it’s furnished with folding chairs and tables. If the oil workers move on, the restaurant can be shut down with little money lost. Hotels and restaurants in some other towns, however, have benefited from the continued booms from oil and gas and now sand mining. Many hotels are booked with nightly rates reaching upward of $400. The hotels’ weeknight rates sell at a premium to weekend rates, atypical in hotel-pricing schemes. Local restaurants boast evening wait times of 40 minutes or longer. Even with hotels at capacity, there is hesitation to expand utilities for potential housing developments for oil field workers and their families. Municipalities think the workers and production will eventually move on, and the developments will sit unfilled or even abandoned. Instead, towns have built RV parks, which require less capital to build and allow oil field workers to move their homes as projects change location. Similarly, the workers have little incentive to invest in long-term housing. Their employment requires mobility. Oil companies have stepped in to fill the housing void by building camps made of mobile or manufactured homes that can be moved along with projects and job sites. Meanwhile, the restaurant owner with the 40-minute wait time has little incentive to invest in a larger building or a second location. The owner believes the demand won’t exist in as few as five years. Whether that time frame is true or not, the sentiment is strong and common throughout the region. The history of many Far West Texas ghost towns colors the long-term perspective of the region’s residents, guiding their decisions regarding the future of their towns and businesses. The direction of land prices depends on the future of oil and gas production in the region. Once production declines and if no other industry emerges, land will likely revert to its next most-lucrative use: ranching and farming (although land used for these purposes sells at much lower values). Until then, residents are inclined to enjoy the current activity’s benefits without necessarily having to invest in it. While outsiders may see an opportunity for growth and expansion, residents remember the booms and the aftermath of the busts and therefore continue operating as normal. * Editor’s note: Hydraulic fracturing, or fracking, is a technique in which a liquid is injected at high pressure into a well to create tiny fissures in the rock deep beneath the earth, allowing gas and oil to flow into the well. While industry insiders spell the term “fracing,” the Real Estate Center uses the more common “k” spelling for general readability purposes. Dr. Kiella is an assistant research scientist with the Real Estate Center at Texas A&M University.